The entry-level Roku Express replaces the Roku 1 with a 75% smaller form factor, better suited for crowded home entertainment centers. (The Express looks more like a candy bar than a hockey puck.) Although smaller, it packs twice the processor power of the Roku 1. The Express streams HD video, but does not handle 4K (Ultra HD) video. On the other hand, it costs just $29.95, which undercuts the price of the competing Chromecast by $5. I was impressed to see that even with a sub-$30 price tag, the Express model includes a high-speed HDMI cable, USB cable, and a remote control with two AAA batteries. An Express+ model with composite cables (for older TVs without HDMI ports) costs $10 more. 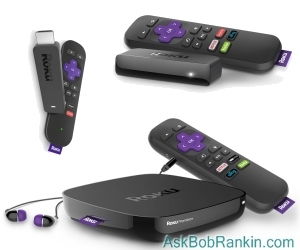 The Roku 2 and 3 models are replaced by Premiere and Premier+, respectively. The $80 Roku Premiere supports 4K video at 60 frames per second; the faster frame rate smooths out 4K motion, which can be jerky at 30 fps. The Premiere comes with a fast quad-core processor and Roku’s standard infrared remote control. The $100 Roku Premiere+ adds support for “high dynamic range” (HDR) content. HDR enhances contrast and expands color range, so images have more depth and look more “real.” A headphone jack for private listening is in the Premiere+ remote control. The Premiere-Plus box has an Ethernet port and a MicroSD card slot. Adding a microSD card to your Roku player makes channels and games to load faster, but cannot be used to store photos, videos or music.You can use the Ethernet port to connect your Roku directly to your Internet router, instead of via wifi. At the top of the line is the $130 Roku Ultra, replacing the Roku 4. Like the Premiere-Plus, Ultra supports 4K and HDR. Its remote control has more advanced capabilities, including “find my lost remote;” press a button on the Ultra box and listen for the loud beep coming from the remote under the sofa cushion. The remote also has A/B gaming buttons. In addition to the ports on the Premiere-Plus, the Ultra box sports a USB slot for plugging in a thumb drive with your own movies or photos. The Premiere, Premiere-Plus, and Ultra models come with “night listening” mode, which equalizes the volume levels of audio so you can hear dialogue clearly but won’t have your eardrums damaged when an explosion occurs on the sound track. All models include voice search via a smartphone app and improved search functionality, a virtual necessity now that Roku offers an overwhelming 3,500 channels. Which Roku Will Rock You? Two research firms put Roku in the lead among streaming media players. Parks Associates said that Roku claimed 30% of U.S. purchases during the year that ended March 31. ComScore recently reported that Roku has a 49% household market share, with Amazon Fire TV, Apple TV, Google Chromecast, and “others” making up the rest. For most folks, I don't see that the Premiere, Premiere+ or Ultra Roku models offer enough extra functionality to justify their higher price tags. Even without 4K, at the $29 price point, the Roku Express makes the most sense to me, especially if you have multiple TV sets. It's worth noting that the 4K (Ultra HD) and HDR features won't do you any good unless you have a 4K or HDR compatible TV set. And even if you do, there's not a lot of 4K or HDR content available yet. But it's the future, and if you want to make sure you're ready, then you'll want the Premiere, Premiere+ or Ultra Roku model. The new hardware can be ordered now, but will not start shipping until October 7, 2016. Everything will be available on Roku’s site and in retail stores, except for the Express+ which will only be available at Walmart. Most recent comments on "[STREAM] The New Roku Family"
I have a ROKU LT that my daughter got me for my birthday last year. Years ago I used to have Dish, but when they wanted to charge extra for local channels I decided that I could watch FREE TV just like I used to in the 1950's. I watch ROKU when all that is on broadcast channels is sports or Wheel of Fortune. The selections on ROKU are both free or paid options and there is a wide variety of choices. It's not a bad addition to my outdoor antenna. I have two Roku's but don't use them much. I received 22 or so channels with an antenna and subscribe to Sling. That is what I am using. I don't understand the popularity of Roku. Yes, we have a ROKU, model 4200x. Have been using it for a few years and my family, from Laos (I'm American married to a Lao lady) watches programs from Thailand and Laos daily. Service is somewhat questionable lately in that programming will just stop and all we get is a "loading with 3 circles" and it never reloads. Have to go back to Menu and reload. I'd like to get a ROKU to take with me on our trip to Laos Nov 1, but not sure what U.S. programming would be available there. All in all, we are happy with it and might upgrade. I had Direct-TV and dropped it for over the air antenna, saved many$!. So I do have high MB cable internet service since I save $$ on cable/satellite TV. So I subscribed to Sling-TV when they were offering a ROKU 3 box for 1/2 price if you prepaid for 3 months of Sling-TV. So I did and have used the Roku 3 ever since over 2 years now. I have no plans for a 4ktv so I will just stick with what I have. Also I have a LG Google TV that I bought in 2013 and now it is basically just a HD TV as Google would not update and so many apps and features are now no longer there! So when I do get a newer TV it will be just that, I will use external components for streaming or apps. I have a ROKU three which is nice, but yes I did order one of these you mention above, the ROKU express, smaller and will do the same thing the ROKU 3 will and $75.00 cheaper. I also have a ROKU TV of which I am giving to my brother as a gift. ROKU is constantly upgrading and offering more and more choices and programing for people to watch. Some of it is very very good and some of it is junk, but that is true even with a regular TV. They have over 3500 channels and the price is right, cheaper than cable TV actually, but you do need high speed internet as it streams through the internet. I have a Roku 3 which I love. Plan on adding a Roku Express as soon as available for second TV. Haven't done away with satellite yet but moving in that direction. I own 3 Roku players. One is the Roku 2XS and the other two are Roku 3's. We use them every day and have about 156 channels loaded. I think they are the best bang for the buck out there. I really enjoy the 'Private" channel choices being offered. I only pay for 2 channels but I already had those before the Roku. Those 2 channels are Netflix & Amazon Prime Video. Great little players. I've been a Roku owner since they first came out. Right now I have a Roku TV in the living room plus a digital antenna and an older Roku model in the bedroom. I "cut the cord" completely 2 years ago and will never go back! I do subscribe to Netflix & Amazon Prime but with all the free content I have access to I may rethink that in the future. SideNote:I recommend that everyone who has a Roku check out the Roku Guide online. There are many free, private channels that can be added to Roku that you can only find there! I will be upgrading to the new Roku for my bedroom because the feature to equalize the sound is one I've spent years looking for! I used to have a TV that had that as one of the settings and I loved it! When that TV died I couldn't find another one that offered that feature. So upgrading to the new Roku, plus a special setting I've been hoping for is a win win for me! I have a dumb TV that I have been using with a Roku 3 for a number of years. I'm very satisfied with the combination and wouldn't hesitate to replace the Roku if I ever need to. I subscribe to Netflix, Amazon Prime and Express VPN (for Brit shows). I have a digital antenna, but I rarely watch local programming, partly because I've gotten too spoiled by interruption-free TV. channels and PBS. I have a ROKU and pay for Amazon Prime and Acorn TV which I love. I also pay for Sirius XM which gives me simulcasts of all the cable TV stations to listen to as well as great music. That is an unbeatable combination, and I will never go back to cable again My older ROKU XS delivers everything perfectly. I may upgrade some day, but for now it is everything I need. I love ROKU! I had a Roku 3 but its YouTube channel was awful - could never get HD videos to play in HD. Sold it and got a Chromecast. I might consider one of the new Roku's if they have fixed this issue. I escaped DISH about a year ago, and bought a Roku 3 and have been happy with it. Added Netflix also. The only complaint I have is the sound deal, when you watch a movie and then it goes to a commercial which comes in at twice the sound level as the movie.I'm going to get one of those new Express models, for a back-up, can't beat the price for $30.00 better than the $99.00 I orginally paid for the Roku 3. Thanks for the great article, as always. I picked up a Roku HD (older version of a Roku 1) for $20 at a rummage sale. Except for the annoying repetitive commercials it has been a welcome addition. Of course I can only use it at the office where we have high speed wi-fi... As I'm a plain and simple guy the Roku HD is just fine, and I see no need to change to the new bottom of the line unit. Have no need want or desire for 4K or HDR, at least for now. IMO Roku knocks the socks off Firestick and Chromecast so I certainly have no problem suggesting it to others. I think I get what these things do, but as a total neophyte (read that "ignorant") how do they work and what do you have to have as equipment?